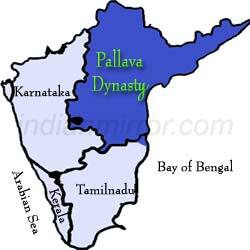 Pallava Dynasty was a pastoral tribe who ruled the southern parts of India for almost 500 years. Pallava dynasty conquered the region of Thondaimandalam that was located at Pallavapuri, The Pallava rulers established their kingdom on the ruins of the eastern part of the kingdom of the Satvahanas. They originally worked as officials under the Satvahana rulers, in the course of time they established themselves as local rulers. Very rapidly their kingdom spanned parts of southern Andhra Pradesh and northern Tamil Nadu. Pallavas established their capital at Kanchi (modern Kanchipuram near Chennai), which gradually became popular and famous for its temples and as center of Vedic learning. Pallavas territory extended from Northern Odissi to Tanjore and Trichi in far south. They were great conquerors and left a huge impact in the field of art and architecture. The Pallava Dynasty fought many wars with the Chalukyas (to the northwest) and the Pandyas (to the south). Both of these states -Chalukyas and Pandyas tried their best to stop the Pallavas from rising, but failed. The Pallava Empire continued to live on until the 13th century AD. Around 14th century A.D, the Pallavas defeated the Ikshvakus and spread their territory as far as the River Krishna. Simha Vishnu is the founder of Pallava dynasty and is considered to be a very efficient and strong conqueror. After Simha Vishnu death, his son Mahendravarman (571 - 630 CE ) became the king. He was a very efficient ruler and a learned man. The construction of the famous cave temple at Mahabalipuram was his initiation. However, the tales of prosperity of Pallava dynasty reached far and wide and Chalukya Pulakesi-II learnt about the richness and abundance of the kingdom. Chalukya attacked the kingdom and defeated Mahendravarman. The society in south India is more of caste ridden, like that in north India. The Brahmins (priestly class) and Kshatriyas (warrior class) dominated the people belonging to the lower castes. Their position was on the rise as the rulers began to grant land to temples and important priests. Religion played an important part in the life of the people in the kingdom. Hinduism held sway in the kingdom and Vedic sacrificial rights were common. The cult of Lord Vishnu and Lord Shiva became important during the period of Pallava dynasty and Kanchipuram became an important pilgrim center for the Hindu devotees. Kanchipuram, the capital of the Pallavas, also became an important center of Tamil and Sanskrit studies. The temples became not the only places of worship, but they became important cultural and administrative centers where festivals were held and people also gathered in the temples to solve local problems, as the temples governed large areas of land and the people thereof. The rulers of the Pallava kingdom were not only great warriors, but also were great patrons of art and architecture. The Pallava kings built a number of important temples in 17th and 18th centuries AD. 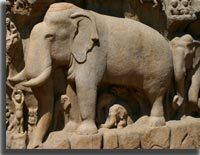 The large rock-cut temples at Mahabalipuram are magnificent examples of the architectural prowess of the artisans of that time. Temple architecture reached its magnificent heigths in ancient India when the Kailashnath temple at Ellora was built in the 8th century. Pallava Dynasty was rich in various cultural aspects including dance, art, and music. Evidence of dancing among the Pallavas has been found painted on the walls of temples, caves and depicted by sculptures. Different poses are depicted and there were individual dances as well as group dances for both men and women. Dancing is the form of entertainment frequently employed in the king's court, as well as temples. Dancing was used as a form of worship; Siva is depicted in the dance called tandava. The principal hobbies of the prince and princesses of the Pallava Dynasty was painting. The walls of the cave temples gave a partial look into this art form and paint can be seen in traces of rich colors. 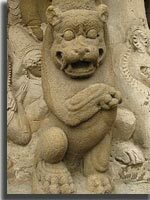 They Pallava dynasty used vegetable colour so the available colors were few, but they included red, yellow, green, and black. The Kailasanatha temple contains nearly fifty cells around the inner courtyard and each of them shows traces of painting. Music also had a prominent place in Pallava society and songs were not only used to praise deity, but even to praise rulers as well. The songs sang their praises and spoke of their individual genius and skill. Rise of Rashtrakutas had seen the decline of Pallavas. Vijayalaya the Chola king, completely vanquished Aparajitavarma the last Pallava king in 890 AD.